The difference between Socialism and Capitalism is that socialism is for the benefit of all in society, while Capitalism is for the benefit of a few individuals at the expense of everyone else. For many in the West, Socialism invokes images of repression, censorship, massacres, KGB, torture, arrests and disappearances in the night, Gulags and salt-mines. Recurring themes from critics of Socialism are that it will make us all the same, that everybody will be paid the same and that it shares poverty rather than wealth. These critics then wax lyrical about how Capitalism makes us all rich. Certainly, under Stalin there was a brutal repression, which had less to do with ideology than it did with power and paranoia. The same held true for many despots, regardless of creed, including Hitler, Pol Pot, Suharto, Amin, Hussein, Pinochet, Milosevic and so on. In the Soviet Union, certainly from Kruschev onwards, the majority of the population lived normal lives, not the 'Big Brother'-KGB-is-coming-to-get-you lifestyle that was portrayed by Hollywood and sold by western governments. These images distract from what Socialism truly is. The obvious difference which most people believe between Socialism and Capitalism, is that capitalism will let them keep their earnings and make them rich while socialism will take all their earnings and make them poor. Nothing could be further from the truth. Capitalism is not about sharing wealth, it is about accumulating wealth. And it is only the few who accumulate it. The rest of us are just commodities, resources, to be used to create wealth for others. Socialism is about sharing of wealth. It requires wealth and requires dedicated work to create wealth. If there is no wealth, then there is nothing to share. The main difference is that Capitalism will leave people to die from poverty in order to defend the rich, while Socialism will share the wealth to alleviate poverty. 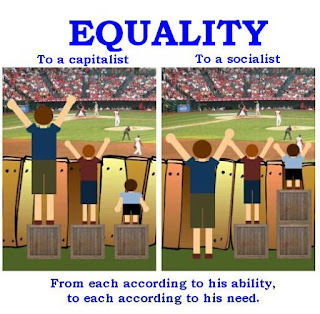 Socialism is about equality of opportunity, not about 'making us all the same'. In fact, Marx was opposed to uniformity. Rather than Socialism making everyone the same, it meets the needs of individuals in society so that no-one is left homeless, unemployed or with some other unmet need. Socialism recognises that we all have different levels of skill and ability ('from each according to his ability'). These needs may differ from one person to the next. For instance, someone who is more resourceful or healthy may have fewer needs than someone who is less resourceful, less educated or less healthy, hence 'to each according to his need'). The belief that Socialism shares poverty, not wealth, is incorrect. Socialism is not about making the rich poor. It is about sharing wealth so that all benefit. There will always be those who are more adept at making money than others. Those people are of benefit to any economy, however, left to their own devices many of them will accumulate wealth for their own benefit and not for the benefit of society. Socialism, like Capitalism, requires wealth to be successful. The difference being that Socialist wealth is not accumulated through exploitation and it is not hoarded to the detriment of the community. One form of Socialism is anarchism, which empowers people to govern for the benefit of society. Laissez-faire capitalism is Capitalist anarchism, but only for the benefit of businesses at the expense of society. It gives businesses free reign in the market-place and rather than government regulation, there is 'self-regulation', which facilitates exploitation of workers through the banning of unions and workers rights and weakened industrial and corporate relations. Critics of Socialism have the misplaced belief that it is incompatible with democracy. Yet Socialism is more compatible with democracy than capitalism is. Capitalism focuses on the individual at the expense of society, and the richer or more influential that individual is, the more 'representation' they have within the Capitalist illusion of democratic government. Socialism focuses on society's needs as can be met through collective achievement, cooperation and participation. Marx believed that 'democracy was the road to Socialism' because Socialism could only succeed if 'the people' were involved in socialist practice. Socialism can only be truly successful in a democracy. There have been a number of successful socialist nations, including Chile under President Allende, Venezuela under Simon Bolivar, Indonesia under President Sukarno, and then there are the successful socialist democracies such as Sweden and Australia. Socialism gives sovereignty to the people, which is consistent with democracy and liberty. In most capitalist countries, so-called democracy allows the people to vote every three or four years. This is not democracy as it is rare for citizens to contribute to the decisions made by government, and instead the rich have more influence over political decisions through lobbying, than the average individual. In a capitalist 'democracy', money has more power than people. In Socialism however, the Government may be comprised of workers collectives, which are made up of workers elected from workplaces and who best represent the needs of the community. They are accountable, not every three or four years, but every day. Representatives can be removed from these collectives at any time. People, not money, have the power. Socialism is not about 'class'. In fact, the capitalist focus on individual achievement reinforces class structure as people strive to be better than others. Rather than segregating classes, socialism ensures that the needs of all are met and that we treat each other the same rather than favouring some over others. In the United States, only the rich can be elected to the office of President. The amount of money that presidential candidates spend contesting an election, is obscene. This perpetuates the myth that the USA is democratic. It isn't. It is plutocratic; the rich rule. Socialism is not about equality of earnings, but protection of workers' rights, removal of exploitation and ensuring workers are paid fairly based on the type of work being performed. 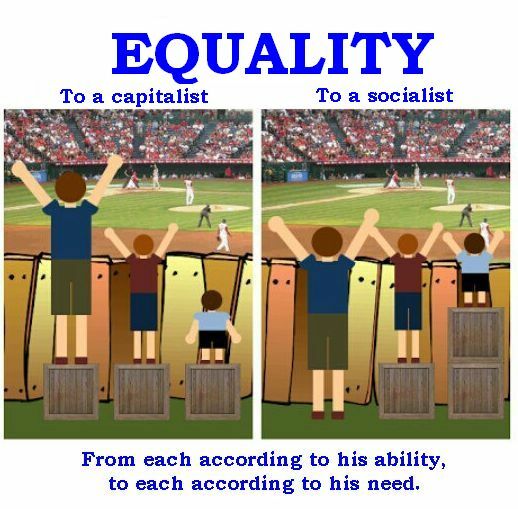 Socialism is not about giving everyone the same wage, but ensuring that no-one is disadvantaged. Marx acknowledged that workers need to be valued higher than they are. Why should a manager for instance, be earning ludicrously more than those who are actually doing the work and taking the risks at the cold face? The capitalist accumulation of wealth by the few essentially means that capitalism shares poverty, not wealth. Wages for instance, should be more equitable than they are. Over the last two decades there has been an explosion in CEO salary packages compared to the average salary. 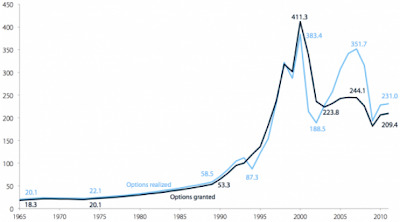 In 2011, CEO salary packages (which include stock options) in the United States were 231 times the average salary in 2011, whereas in 1965, they were 20 times the average salary. Capitalists will argue that this is necessary to attract the best of the best, an argument that assumes that the company is nothing without a CEO exploiting its earnings. What about attracting the best of the best workers? It is the workers who do the hands-on work. It is the workers that produce the company's deliverables. The CEO will usually push for higher productivity through lowering costs, which often is achieved through downsizing its workforce, leaving workers to 'do more with less'. Workers are under-valued while CEOs are over-valued. Why should CEOs receive such exorbitant salary packages? The President of the United States of America, arguably the most powerful man in the world, earns around $400,000 per year. Perhaps there is a greater motivator than money that drives politicians. Rather than motivating CEOs by financial gain and therefore feeding the greed, it would be better to motivate them by other means. Wouldn't it be better to hire a CEO who genuinely had the company's interest at heart? This is where worker controlled production has its advantages. Workers have an inherent interest in ensuring the company stays profitable and productive. While they obviously should be financially recompensed for their performance as well, it should not be at a level that exploits others. There should be no-one accumulating wealth from the company at a rate far greater than others employed by the company. Rather than arguing about capping the minimum wage, it would be more beneficial to restrict maximum wages, particularly for executives ensuring the wealth is more equitably shared among the workers, the ones whose labour makes the company profitable. Raising the minimum wage is not the issue for many large businesses, it is the effect of exorbitant executive remuneration packages. Large corporations should not be owned and controlled by a few wealthy people, they should be owned and controlled by the workers. The wealthy operate for their own benefit. It is better that workers run the company for the benefit of all with the interests of society at heart. Private ownership is a hallmark of Capitalism, however under Communism and Socialism, individuals can own property and small businesses, the main difference being that the sources of production (such as factories), infrastructure and services (e.g. banking, education, health) should be owned by the State and operated by workers' collectives. And then there is argument about welfare, that those who draw welfare from the government are parasites on the system. Yet, little is said about corporate welfare. Many companies receive some form of government assistance in the form of subsidies and tax breaks. 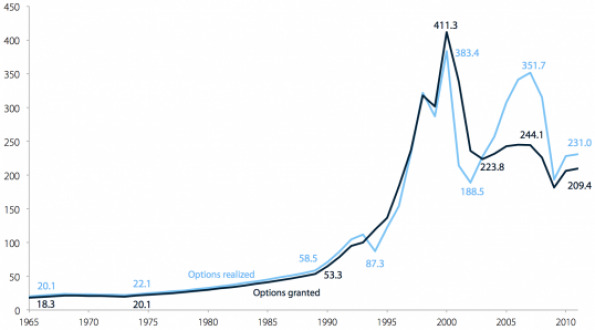 The GFC highlighted the dependence of big business on government when many companies were bailed out. Yet there was no bail-out for the ordinary citizen. Ironically, many of these same companies are paying very little tax as they take advantage of foreign tax-havens. It is the workers who are left paying full tax while companies exploit the government. It isn't welfare recipients who are the parasites, it is those companies who avoid their tax obligations. They are ones who benefit from the government, from the markets, from the consumers in their nation, while avoiding their obligations to contribute to society through tax. In 2012, large US companies had accumulated $1.5 trillion in tax havens 3. This is enough to clear the US deficit, which is around a trillion dollars 4, and put the economy back into surplus. The belief that taxing the wealthy will destroy the economy is false. From the 1940s to 1960s, the top marginal tax rate in the USA was above 90%, and from then until 1981, the top rate was 70%; now the top rate is 35%. Yet the USA flourished during the time of higher taxes on the rich and economic inequality, the gap between rich and poor, was nowhere near as significant as it is now. 'People are naturally inclined to be selfish, so forcing them to share is useless and against nature', so goes one argument against Socialism. Certainly people are selfish, but is it against human nature? How often do we see people rally to the help of others following disasters, or giving to charities? Selfishness is only one aspect of human nature, the 'bad' side, but it is the one that capitalism indulges and encourages. It is also human nature to help others and to not hurt others. That is part of the 'good' side of human nature. It is this selflessness that Socialism encourages. The argument that states that individuals are naturally selfish, is self-defeating. If anything, this argument adds credence for why a Socialist government is necessary for ensuring that all members of society both contribute to and provide for each others needs. 'From each according to his ability, to each according to his need'. However, it is human nature to care and share with others. Christians often oppose Socialism because they claim it is opposed to God. Certainly Marx did say that 'religion was the opiate of the masses'. Marx was not a theist. However, Marxism is Christianity without Christ. A lot of what Marx espoused is also espoused in the bible. The commands to love each other as yourself, to share your wealth with the poor, the widow, the refugee. These are concepts that are found in Marxism. Marx was against exploitation and greed, just as Christ was. Besides, where is God in capitalism? Capitalism is the opiate of the masses. It feeds greed and selfishness. It deadens our compassion for others as we strive to better ourselves at the expense of society. Capitalism is not Christianity and is certainly not the economics of the Bible. Jesus was a Socialist, in fact, Acts 4:35 talks about distributing wealth 'to each as anyone has need'. The great financial crises of the 20th century were caused by capitalist greed and they were only rectified by socialist ideals, in particular those of John Maynard Keynes. Some capitalist governments, such as those in Spain, Greece and England decided to embark on austerity programs in which they slashed government expenditure. The effect was that demand dropped as people had less money to spend, factories closed down due to the lack of demand and unemployment rose. A true Socialist government would be run by the people for the people. Unfortunately, some of the examples we saw during the 20th century were focused on shoring up individual power rather than benefiting society. If anything, governments such as Stalin's Soviet Union, or Mao Tse Tung's China empowered a few of the 'privileged' and disempowered the multitude. How was this different to a capitalist nation? Stalin and Mao removed individual freedoms, limited movement and criminalised criticism. In a true Socialist state, freedom is crucial. How else can improvements be made without freedom to criticise. Marx understood this and encouraged criticism and comment. Rather than a closed state, Marxism requires open borders, a global effort, an internationalist effort. Although the 20th century was dominated by numerous wars that were funded by both the Soviet Union and the U.S. and her allies, Socialism is in fact not about war. It promotes peace. Following the Russian Revolution in 1917, one of the first things the Bolsheviks did was to withdraw Russian troops from involvement in World War I. It was the European Imperialists, driven particularly by Britain, who took the war to Russia, backing the pro-Tsarist White Army as it waged war against the Bolsheviks in the Russian Civil War. The Red Army, fighting for survival, was eventually successful. But did the civil war need to be fought? The Russian Revolution itself was relatively peaceful. It was the civil war, driven by pro-Tsarist and Imperialist forces, that caused the loss of millions of lives. Without the backing of International Socialists, the establishment of socialism in the Soviet Union was always going to struggle. In addition to the millions of lives lost following World War I and the Russian Civil War, the nation was racked by drought and poverty so there was no internal wealth to redistribute. The success of Socialism in the Soviet Union required the assistance of international socialists as described by Marx years earlier. Unfortunately, the West sees the Soviet Union as exemplar of Socialism. It is not. Socialism can be successful but requires the input of all to make it work. The world as we know it, is racked by poverty, famine, disease, war and injustice. The most powerful capitalist countries, the United States and United Kingdom have high levels of poverty and unemployment, and have been unable and unwilling to truly help either their own poor or the poor of other nations. Instead, they have sponsored the building up of the rich at the expense of others, through the exploitation of others. The richest 300 people in the world own as much wealth as the poorest three billion(5)! The richest nations were built on a history of genocidal imperialism and slavery, destroying cultures and exploiting native populations in order to steal their natural resources. The West is horrified by the crimes of Stalin or Mao Tse Tung, but fail to acknowledge their own horrendous crimes against humanity. Capitalism encourages the 'Gollum' attitude of 'my precioussss ...', in which people are so willing to accumulate wealth and power, whether it belongs to them or not, that they will kill, lie and steal. This focus on individual gain at the expense of others results in people fearing the loss of their 'precious', the loss of what they hold dear, which is material possession. This fear and greed is what has led to wars and injustices across the global. Socialism requires commitment from all to each other, it requires democracy and the free expression of ideas. It is time for a Socialist revolution. It is time for the exploitation by the richest few to cease and to be replaced by a fairer system of equality that meets the needs of all. There is more than enough wealth in the world to permanently remove poverty which is why we need a new system that equitably shares this wealth. As Mahatma Gandhi once said, 'Earth provides enough to satisfy every man's need, but not every man's greed'. 2. 'CEO Pay Comparisons', http://www.payscale.com/data-packages/ceo-income, accessed 6 April 2013. 3. Alternet, 'Tax dodging by the rich cost you $1,026', http://www.alternet.org/guess-what-tax-dodging-rich-cost-you-1026, accessed 6 April 2013. 4. US Government Spending, 'US Federal Deficit by year 2008 - 2017 - Chart analysys', http://www.usgovernmentspending.com/federal_deficit_chart.html, accessed 6 April 2013. 5. Upworth.com, 'There's Around $223 Trillion In The World. Here's Who Owns Most of It', http://www.upworthy.com/theres-around-223-trillion-in-the-world-heres-who-owns-most-of-it, accessed 12 April 2013. Your equality comparison of socialist and capitalist is misguided. The basis of this analogy is that the box represents wealth, and the three people represents the tree types of people. The tall is intelligent and hard working, the shortest is the unfortunate, and doesnt work hard for his wealth. This pictures depicts that there is enough wealth to be distributed to benefit everyone. However, that is not he reality of this world as of 2014. The picture should show a higher fence, in which the taller man can enjoy the game only with the box under his feet. While the other men have no chance to see the game. What you're suggesting is to take the box away and cut it so that the wealth is shared equally. Now, however no one can see the game. And the incentive for the intelligent and hard working man will wither away. Now, everyone is at a loss. Let the tall man see the game, and let capitalism continue to grow. Don't be too concerend with jealousy around you. If you are born gifted, work hard for your wealth, you should not be demanded to share it unless it your joy. Get the picture clear and maybe you won't base your whole article from a blind perspective.